Rakusan did not include the Fan Series in his main sequence numbering. Therefore, the original number used for each of the 36 Series prints has been modified to identify the Fan Series members of its theme. The five different fan silhouette shapes have been here assigned arbitrary numbers 1 through 5. To indicate a fan design these shape designations are added to the 36 Series number separated by a hyphen. 111-2 is the Fan Series design with fan shape 2 in the 111 Grape theme. Like all other designs in this series, 111-2 was only produced in a single print run, and few copies are currently documented. 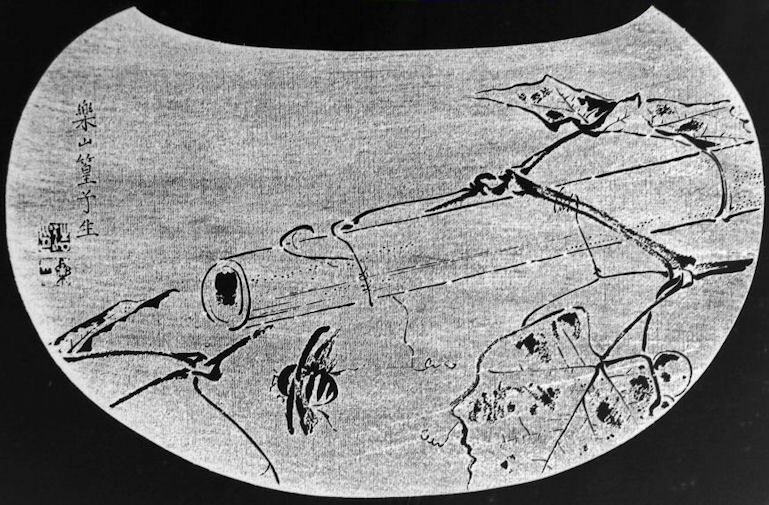 The composition of 111-2 includes a portion of a grape vine supported by a horizontal bamboo pole. There is a single bunch of grapes at lower right mostly hidden by a leaf. Flying just below the end of the bamboo pole is a beetle. 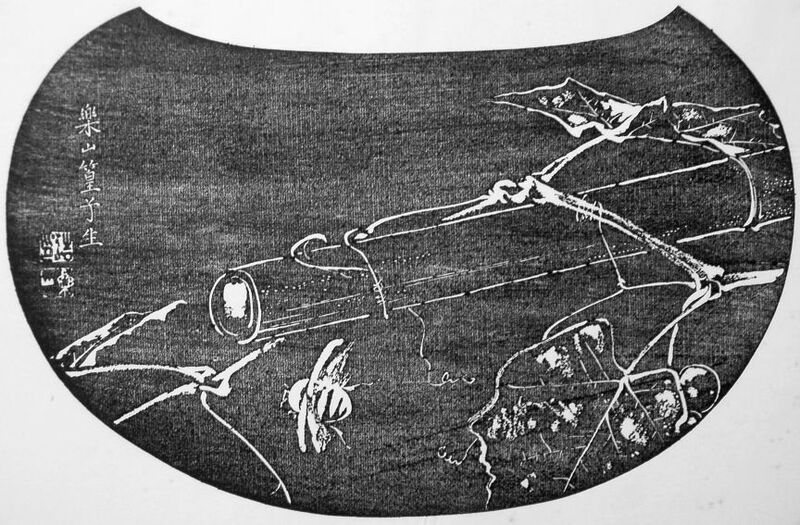 In these sorts of compositions with a flying insect Rakusan usually drew the insect larger to indicate it is closer to the viewer in order to provide the illusion of depth. All of the elements are carved so that the ishizuri version is an exact negative of the original model. Japanese Beetle, Popillia japonica, 豆黄金, まめこがね, マメコガネ, mame-kogane, lit. 'bean yellow-gold', is especially fond of eating grape vines. This species also occurs in a Rakusan painting (not yet posted online). The general name for any beetle in the family Scarabaeidae is 黄金虫, こがねむし, コガネムシ, kogane-mushi, lit. 'yellow-gold insect', describes the metallic iridescence characteristic of many species in the group, including Japanese beetle. 111-2 is the only Rakusan example of a flying beetle, and identifying the species would be difficult only from such a stylized drawing. However, since a similar beetle appears in 111-1 in this same theme, it is reasonable to assume that both beetles are intended as the same species. Details of the body shape in both designs, the striped body in 111-2, and details of the elytra patterning in 111-1 confirm the identification.